No matter whether it is a flop time for Akshay Kumar post Chandni Chowk to China movie or not, this Superstar can’t sit back and relax. He is not out for Fear Factor Khatron ke Khiladi Season 2. Akshay Kumar is all set to return to the small screen again with the new season of Fear Factor Khatron ke Khiladi on Colors channel. 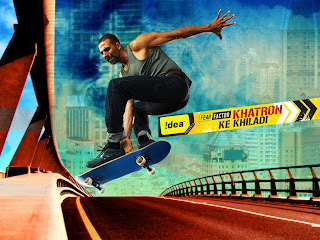 In Khatron ke Khiladi Season 1, Akshay was seen with 12 gorgeous television actresses and the winner was Nethra Raghuraman, who won Rs.5 million as prize money. At present, the auditions for Fear Factor Khatron ke Khiladi season 2 are been held in Mumbai, Lucknow, Delhi, Kolkata and Ahmedabad. “The show is going to be a notch higher in terms of bigger celebrity participants than the last season, the difficulty level of challenges and even Akshay Kumar. The inclusion of the common man as a co-contender will definitely create a lot of excitement,” said Ashvini Yardi, programming head, Colors.